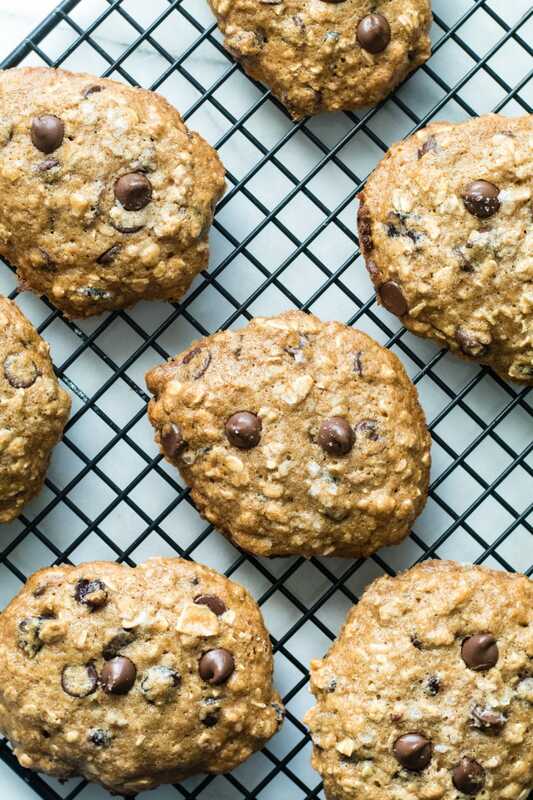 Chocolate Chip Muesli Cookies – for breakfast or for dessert, it’s up to you! Talk about mouth watering!! These cookies are not only delicious but also packed with a ton of nutrients. I have always been a fan of oatmeal raisin cookies but I think these ones taste so much better! They are chewy, moist, and a little more substantial than just your regular oatmeal raisin cookie. I have yet to make my own homemade muesli, so I had some leftover Bob’s Red Mill and used that in this recipe. I’ve also used the brand Seven Sunday’s and it works well too! In attempt to make these cookies “healthier” I cut back on the brown sugar, added some honey and used applesauce as well. I used hemp seeds for a boost of protein and omega-3s. The texture of these cookies is simply amazing with a just little bit of crispiness in each bite. The combination of healthy fats, protein, fiber, and antioxidants in these cookies makes it feel like you aren’t even eating a cookie anymore! Hope you enjoy! Cookie for breakfast or dessert...you decide! Gooey, chewy, and chocolate-y! Sift flour, baking soda, cinnamon, and salt together. Set aside. Whisk together applesauce, sugar, honey and vanilla. Beat in the egg and then add in the flour mixture and mix. Stir in muesli, chocolate chips, and hemp seeds. Drop by tablespoonful’s on lightly greased cookie sheet and bake for 10-13 minutes. Makes about 14-16 cookies depending on size. This original recipe was made in March 2nd 2015 (holy moly!) and I retook the pictures + made a recipe video for you all in Aug. 2017! Enjoy! These look delicious! I love a good chocolate chip cookie and love that these are so healthy! These looks delicious! Oatmeal raisin was always one of my favorites. Homemade muesli is on my to-do list as well! These look incredible! I love how muesli adds crunch to baked goods. 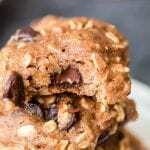 I make vegan scones with muesli and they are one of my all time favorite food creations – now I’ll definitely have to try these cookies! Love the use of muesli! These sound so tasty! These look like they would be amazing. I dont’ have any muesli – do you think subbing this with granola would work? Thank you!! You can use oatmeal instead 🙂 Enjoy!